Weve taken garden-fresh roses and dipped them in butterscotch. Vibrant yellows and crisp oranges take on golden hues for a sweetly elegant gift with warmth and irresistible charm. 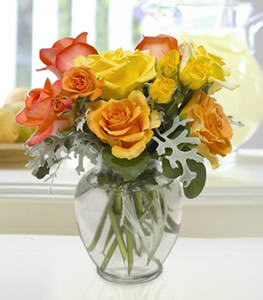 Roses in shades of orange and yellow paired with stems of spray roses accented with dusty miller. Arrives in a clear glass vase.